Advertise With Us Advertise With Us - GUI Tricks - In Touch With Tomorrow! 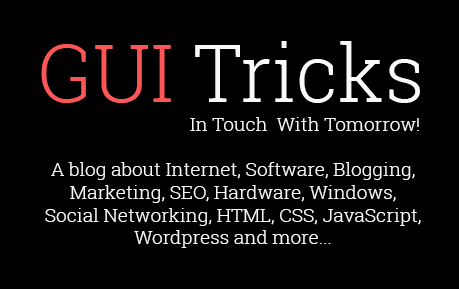 GUI Tricks is a popular technology blog. We update our site on regular basis and we are working too hard to continue to grow our audience. We provide highly quality tech related contents with our readers which help them to seek about Information Technology. Why Advertise With GUI Tricks? This is most important for our Advertisers to know 'Why advertise with us?' GUI Tricks is a technology blog as you know. We have foundations on Social sites where we market our contents or updates to grow audience. We receive almost 2000+ daily page views or impressions and 50000+ monthly from the world wide especially from UK, USA, India and Pakistan. Similarly, our Alexa rank is also less than 250k and increasing as well which makes our blog quite attractive in views of readers. So, if you wanna advertise your products or wanna promote them through us, then GUI Tricks is the best source for you. We accept advertising from topically-related companies or blogs. If you're interested so must check our rates before contacting. We also enable Sponsor posts opportunity and sell do-follow links in cheap rates. Sponsored posts or reviews about products help to promote product rapidly. Professionals also force this way, after advertising. If you're not interested or can't afford advertisement banners, so promote via Sponsor posts. These high quality posts provide the value readers seeks and typically receive continuing attention on Facebook, Twitter, Google+, LinkedIn and Pinterest and are always optimized for SEO. Contact on guitricks7@gmail.com for pricing information and availability.